Mohammed Rharsalla was one of Slovan Bratislava's main threats. 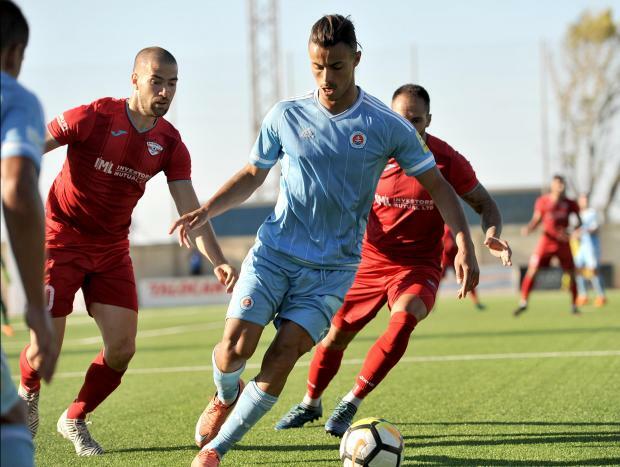 Balzan’s European campaign was ended by Slovan Bratislava after the Maltese side suffered a 3-1 defeat in Slovakia, as Slovan qualified with a 4-3 aggregate in the second qualifying round of the UEFA Europa League. Slovan Bratislava exerted their pressure from the early stages of the game in order to find the goal that would enable them to level terms on aggregate and would seal qualification for them. Aleksandar Cavric, one of Slovan’s main threats, managed to unlock the score five minutes later. Mohammed Rharsalla sped down the left flank before sending a cross into the box, which Steve Sultana deflected into the middle. However, the ball dropped onto Cavric’s feet, who sent the ball into an empty net. After the change of ends, Balzan were starting to push numbers forward but their chances of qualifying were dealt a heavy blow when the Slovak side was awarded a penalty after Elkin Serrano tripped Andraz Sporar inside the area. However, the latter failed to convert from the penalty spot as Sultana denied the Slovan forward. Yet, the Slovenian striker found his way to list his name on the score sheet when on minute 70, he made his way into the box before firing a shot from a somewhat tight angle to make it 2-0. A minute later, Sporar all but sealed qualification for his side with his second of the evening, the third for Slovan after netting into an empty net following a quick counter-attack from the Slovakia side. Balzan were not yet done as Kadu pulled one back from a spectacular free-kick, 15 minutes from time. Buoyed by this goal, Balzan forced Slovan to defend in search of a second which would had sent them through but Slovan held to their two-goal lead to advance into the next round.